From May 15-19, 2019, we will once again congregate in Iowa City to celebrate our 13th Annual Russian Guitar Festival! IARGUS 2019 will feature artists including (but not limited to) Martin Bagge, Laude Novella, Mårten Falk, Marko Erdevicki, Stefan Wester, Vadim Kolpakov, and more! Martin Bagge, born 1958, is considered one of Sweden's leading singer-songwriters. His performances, spiced with acting, burlesquery and comedy, have received great reviews from public and press all around Scandinavia and Germany. Since the early 1990s he has specialized in Swedish poetry based on C.M. Bellman. Bagge also creates historical performances around poets like Wivallius and Lucidor, whose psalms and songs he has reconstructed. Bagge's album with new compositions on Harry Martinson's poems, The Way Out, has received fantastic reviews. He has released around 20 CDs and LPs in his own name, and toured in the USA, China, Great Britain, the Netherlands and other countries. Martin Bagge was appointed president of the Swedish Song Academy in 2003. In 1991, Per Mattsson joined forces with Ute Goedecke to form the ensemble Laude Novella. Both Per and Ute are versatile multi-instrumentalists, who perform diverse programs in varying contexts. These include concerts in Cathedrals, churches, and castle ruins, as well as festivals for medieval music in Sweden and other countries, including Denmark, Finland, Germany, Holland, Italy, Latvia, Lithuania, Estonia, Ukraine, Russia, Morocco. In the early 2000s, Per and Ute collaborated with the Novosibirsk musicians on a program based on a manuscript about the music–making of Swedish prisoners-of-war in Siberia in the early 18th century. Mårten Falk is one of Sweden’s most successful guitarists. He has toured many countries around the world, throughout Europe, Asia, and the Americas. Mr. Falk's seven solo albums on dB Productions have been met with critical acclaim around the world, and he has been featured on many of his colleagues' albums. Mårten Falk has performed in radio in many different countries and he has taught master classes around the world. Many composers have dedicated their guitar pieces to Mårten Falk, and he has given more than 100 world premieres of music by composers from four continents. Mårten Falk performs on many original instruments from the Renaissance to the 20th century, including the lute, vihuela, baroque guitar, romantic guitar, Russian seven-string guitar, traditional guitar, and half-acoustic guitar. Serbian-Norwegian guitarist Marko Erdevički holds a Master’s degree from the University of Agder (Kristiansand, Norway) where he studied with Jan Erik Pettersen. Currently, Marko lives in Bergen (Norway), where he teaches classical guitar at the Bergen Municipal School of Music and Performing Arts. Marko has performed at many festivals such as Kvinnherad kulturfestival, Bjergsted Guitar Festival and Norwegian Guitar Festival (Norway), ‘800MusicaFestival (Milano, Italy) and IARGUS 2017 (Iowa, USA). He is laureate of many international competitions, most notably: second prize at the international competition in Plovdiv (Bulgaria), second prize in the Guitar Art Festival in Belgrade, and third prize in the multi-instrumental contest "Unge Talenter på Sørlandet 2006" in Arendal (Norway). Most recently, he has devoted himself to the performance of the 19th century guitar music on original, historical guitars. This affection led him to the Russian 7-string guitar and acquaintance with Oleg Timofeyev, who introduced him to the music of Andrei Sychra (1773-1850). Mr. Erdevički performed Sychra's monumental Four Concert Etudes at IARGUS 2017. This year, the music of Mikhail Vysotsky (1791–1837) is on the menu. Stefan Wester was born and raised in Alingsås, Sweden. He studied at the Royal Academy of music in Stockholm with Rolf La Fleur, and at the Lulea University of Technology College of Music in Piteå with Tilman Hoppstock and Zoran Dukic. Stefan lives in Piteå, where he teaches guitar at the School of Music and Dance. Stefan performs as a soloist on a regular basis, as well as in various chamber music ensembles. He works with contemporary composers and has premiered several works dedicated to him. In May 2014, he premiered Julia Finkelstein's suite, Miro's Paintings, in Iowa City, IA. Since 2007, Stefan has been helping revive the Russian 7-string Guitar and its repertoire, and is a frequent performer at IARGUS. Stefan Wester is a prolific arranger and composer for solo guitar, guitar and other instruments, guitar ensembles, and guitar orchestra. 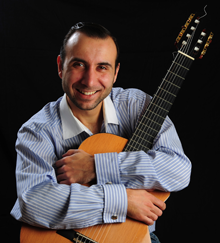 Coming from a long dynasty of Russian-Romani (“Gypsy”) musicians, Vadim Kolpakov is a virtuoso on the Russian seven-string guitar, as well as a singer and dancer. He has performed extensively in Russia and abroad, from the Kremlin to Carnegie Hall. He has also participated in numerous musical projects on Russian, Canadian, and American radio and television. Since the mid-1990s, he has been a member of the Russian-Romany group The Kolpakov Trio, and in 2004 he assembled his own group in the United States, Via Romen. His repertoire is based on music for the Russian-Romani (“Gypsy”) guitar, but he often performs Russian, classical, rap, pop, and world music. In 2008 and 2009, Vadim went on Madonna’s “Sticky & Sweet” world tour as part of The Kolpakov Trio. Since 2006 he frequently performs with Zingaresca, a duo with Oleg Timofeyev. A graduate of the University of Wisconsin—Madison school of music, Kristian Svennevig studied notable teachers such as Kato Havas, Shmuel Ashkenasi, and Lorand Fenyves. 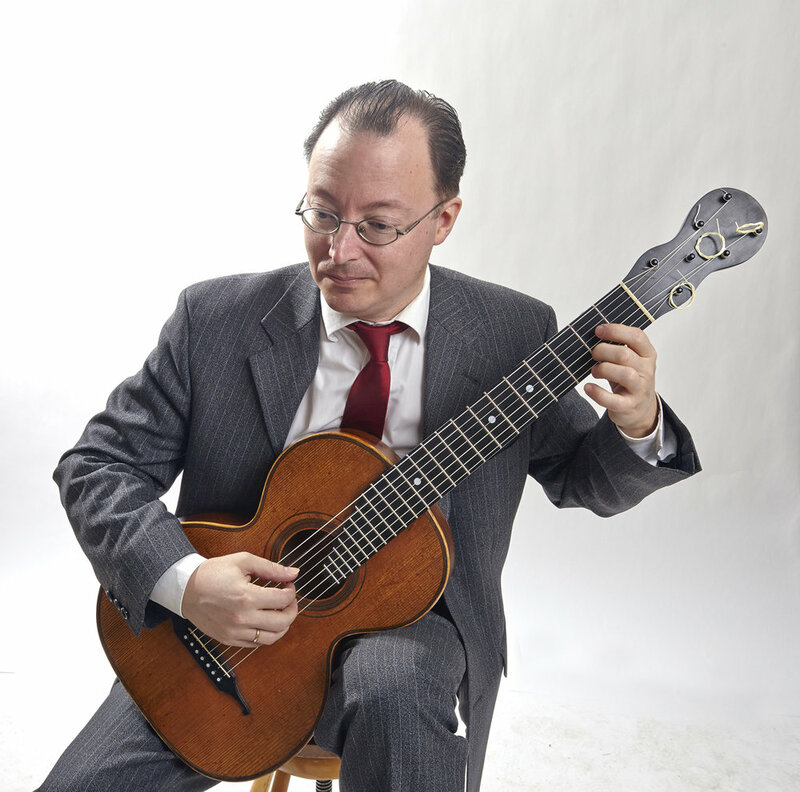 He is a professional music educator, performer, and a founding member of the jazz manouche group Hot Club of Davenport. He has performed throughout the country including at the Regis in Chicago, Times Square, Carnegie Hall in New York, the Bix and at Detroit International Jazz festivals. He has also toured with the multi platinum rock group Foreigner, and other diverse performers such as Marin Alsop, Dan Levinson, Vince Giordano, and Dave Eggar.